Well into my middle years I held onto the hope that as I aged something of life would become clearer, more certain. Crossing into the latter half of life I recognized that hope for the illusion it is and am giving it up. Now I cherish the sense that life’s mystery is deepening for me, growing at once richer and more obscure. Unexpectedly, I even find myself hungering for the darkness of this mystery as it grows less frightening and more welcoming. It’s hard to explain, even to myself. O mystery, you are alive; I feel you all around. You are the fire in my heart; you are the holy sound. You are all of life; it is to you that I sing. Grant that I may feel you always in everything. These days of grounding have been my opportunity to listen again for the “silken sound of whirled infinity” that’s too often “lost in voices shouting to be heard” (William Alexander Percy’s words). While I haven’t heard any voice I could call clear – clear voices grow more suspect for me with every passing season – I have heard the whispers of a silence that seems more authentic and trustworthy, inviting me to a calm unruffled by the barrage of news that has pummeled me especially for the last six months. 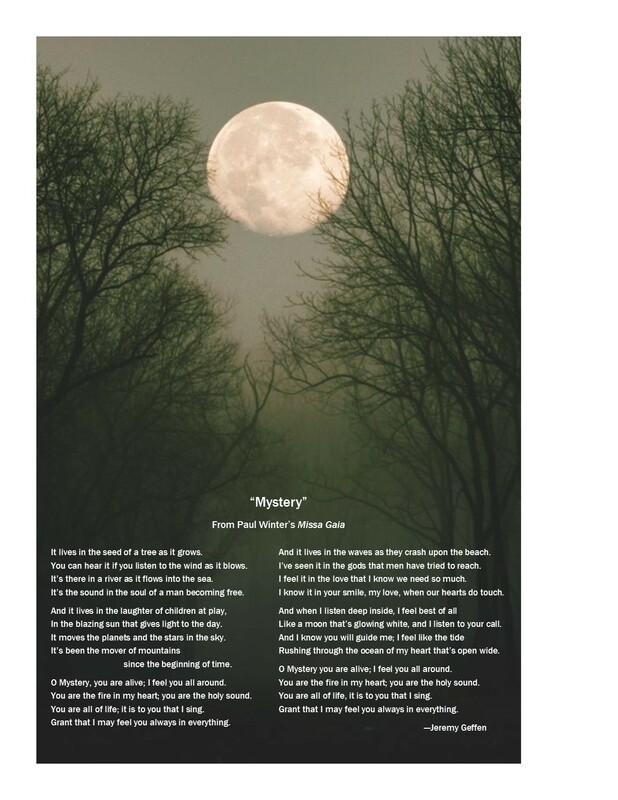 If you haven’t heard “Mystery” as Susan Osborne interprets it in Missa Gaia, take a few minutes to listen to it here.